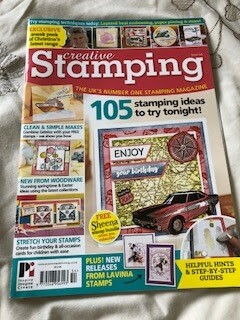 I treated myself to the latest issue of Creative Stamping and indulged myself in making a few cards one day while the baby was asleep. There was a large A4 sheet of clear stamps as the free cover gift that had a travel and transport theme - handy to make cards for men. I decided to make a version of the card featured on the front cover of the magazine with a few differences. First I stamped the road map rubber stamp multiple times over a white square card blank - you can only tell the pattern repeats if you look closely! Then I cut a border to go around three sides from an old envelope I'd received in the post and kept. Next I used the car stamp and the signpost stamp on red card and cut around them and stuck them onto the card. I stamped the top part of the signpost again so I could cut out two of the arms and use a small adhesive pad to raise them from the card. 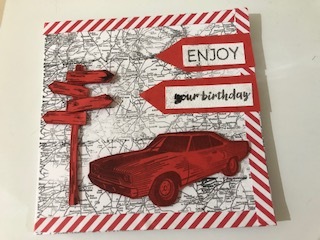 I used the 'enjoy your birthday' sentiment stamps as on the card on the magazine cover, and mounted them on red card so the colours brought the whole card together. I like this card but unfortunately after making it I can't find the car stamp anywhere - that's the problem with clear stamps! 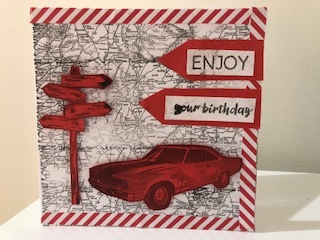 I'm sharing this with Cardz 4 Guyz where the theme is travel or transport and Craft Stamper where anything goes as long as you use a stamp, Moo Mania where the theme is masculine and Challenge Up Your Life where the theme is vehicles. What a fantastic card project! Thank you very much for joining us at Moo Mania & More! Great masculine card! Thanks for joining us at challenge up your life!